Lillian Dodson...kind of a big deal around here. Your Humble Rockstar Framer is truly honored that Lil would even consider showing in my little gallery...truly. But she didn't even have to consider when I got the courage to bring a show, here at Ripe, up to her. Lil is amazing...aka. Dame Billian. I won't disclose her true age here, but this sister is rockin' it! Lil is the real deal...she's a well-respected artist from right here in Huntington. Married to Stanley Twardowicz...collected by museums...faculty at Hofstra U...kind of a big deal! And this piece, "January", is from 1/2011. Loose and free...very moody...feels like this January to me. That's Mary the Painter,...very well known in this area...and Linda the Potter...from Huntington. And here are Jeanne the Art League, (big deal...) and Norm the Jeweler, and his sweet Swedish wife. These people are all important in the art education scene here on LI. So lucky to have a "Grande Dame" like Lil in my life, who brings amazing insight, humor, and understanding to this thing we can "The Art World". Together, with my fearless PainterGrrls, Ripe transforms spaces into amazing living environments. What we're looking at today is the home of The Shoeman. We transformed everything that was white (which was everything...) into a cool, sophisticated home for a pimpin' Shoeman. This hasn't been an easy job, and those sweet monkey girls have been in this home for three, 3!... weeks! They ROCKED it out,..and now your Loyal Rockstar Framer is going back in solo to lux this sweet crib out. This is a house I painted in when I first started about 7 years ago...I did the family room/kitchen and the kid's rooms all fauxed out. So this will be a cool showcase of what I can do with color and pattern. We might even have a hand in the master bath renovation! Will keep you posted with some finished pix soon. xoxo! is my friend. She's 83 this year. And she's hilarious. But she had a stroke this past weekend, and is in the hospital. He said she loves me. Which caught me up. Because I love Ethel too. She's one of the oldest friends I've ever had. I literally do anything for Ethel. I come to her house to pick up and deliver framing, and drop her off in town. She's totally cool. And a badass in her 83 year old body...that's giving up on her. So in-case you read this and know Ethel, she's in Huntington Hospital. Her family is moving her up to Ithaca, to a rehab. But it's not good. I'm going to say goodbye to her tomorrow am. THis show comes down this weekend...I for one am not over it yet. Which is highly un-usual,since I'm usually over it once I hang it. It may be because this show, I hung with Niko himself...Which Rarely happens. I like to hang show's by myself. It's easier for me to work alone. But this one Niko helped hang the "Rhino" and the Dragon Surfboard. Oh so what's with the camera? That's your loyal Rockstar Framer, fulfilling my Rockstar duties, signing a release form for my interview on that camera (photo credit...Karl the Brit)...seem Niko showed up with his own camera crew, and they interviewed me, and Mrs Niko...the Amazing Mistress V. Von Twistern. 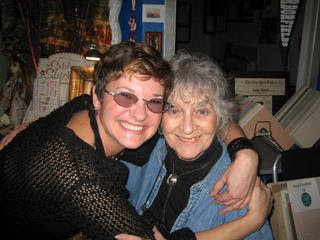 with the Intriguing Maxine...our favorite lady...she'll be showing here in May...all BLACK...........Fabulous! So, this is Trixie...the gallery dog...Miss Trixie Loo....the not-so mysterious voice from the backroom...my best friend. Trix comes to work with me everyday, we're rarely out of each ear-shot. She has a seat belt in the car, and a bed in the backroom with her "Manager" sign on top. I think that she thinks she owns the place, and that I'm an employee. She doesn't really care for other dogs. She much prefers to hang out with kids, and select adults. If you meet her and she lets you touch her, she'll probably make a "Yip" and run away. She's very dramatic...You didn't hurt her, she's just very cautious about her ears, and being handled by first time visitors. I like the cautious nature of Trixie, she's a great manager, always letting me know when someone has arrived, or at the backdoor, and in a few cases, if you're a creep. This photo by good friend, The Pet Photographer. Baby Trixie...about 13 weeks old...7 pounds.